Want to be a white ally? Three tips from the 2018 Golden Globes. PRESENCE. White evangelical leaders should be asking themselves what their presence at an event, institution, or publication means. If you agree to speak at an event that that does not include the voices, concerns or narrative of people of color you are saying something to me. If you are a male who feels super proud of a publication or event you have hosted that is so “diverse” but only a miniscule portion of your expert voices are women, you are communicating something loud and clear. If you remain at your institution and generation after generation of people of color leave with scars that may take decades to heal after realizing that ceiling is only so high, you are endorsing. Your presence means something. 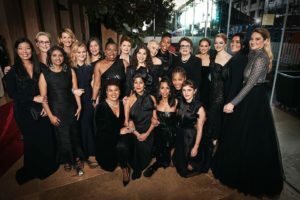 At the Golden Globes this year, the choice to “show up” and be fully present in Black was a show of power that let everyone know #timesup. Celebrities didn’t boycott or ask to cancel the event, they showed up and said something with their very presence. How do you show up where you are invited? Does your presence pave a way for under-represented voices to be heard? SPACE. White leaders that think creatively about their space make fantastic allies. They don’t just get dressed up and head out to the party, they ask who else should be in the room and invite them to come along. A true partner is someone who doesn’t just feel sad that you are not in the room and express indignation over the injustice of it all- they get you in the door. This is especially frustrating when the white leader is the one in the room talking about the injustice of centering whiteness or the plight of the immigrant or refugee, or how we need to have more diverse voices for the future of the church to survive. Be creative. Here are just a few ideas by the quiet few who don’t publicize their actions. If you are a white author and you are promoting your book on race, justice, privilege, worship, leadership, etc., don’t do your podcasts, speaking events, and radio spots alone. Bring an author of color who has complimentary ideas to share and invite them to promote their book. Bring the people who actually bled and cried and were scarred for your epiphanies about justice. Suggest to your publisher that your book be sold in a bundle with books by authors of color at conferences. Make a commitment to refer a speaker or preacher of color at every event that you attend. Maybe towards the end when the organizers thank you for coming you take the time to add, “It’s been great to be with you guys, have you ever had ________ speak? She would be fantastic. Let me send you her email and website so you all don’t miss out.” As women of color we do this for one another all the time. Organizers LOVE it and usually invite them. Refer a friend. This can also be done for every event you turn down, or writing projects where you are mature enough to admit to yourself you would not be the best voice on the topic. Decline the invitation with a referral for three women of color who would add phenomenal insight. (If you don’t know three of us I just got sad for you.) Don’t operate out of scarcity. WORDS. No one will ever forget Oprah’s words at the Oscars. I may not remember every detail, but I will remember that she chose to use her time to do a few key things I think we can learn from. Make others known. In her speech Oprah made reference to an African-American woman from Abbeville, Alabama, who was abducted and raped by six white men in 1944. She said, “There’s someone else, Recy Taylor, a name I know and I think you should know, too.” Her statement left hoards of people googling a name tha was formerly unknown to many. White leaders have an opportunity to make others known. Not just “women of color” but names, ideas, books, resources. Tell our stories, quote our books, reference our work. Advocate beyond yourself. As a woman of color, Oprah knows there are many heroes who never get seen. She used her time to talk about other actors who inspired her, the characters she has played, her hardworking family, the girls watching, Recy Taylor, the women who are standing up and saying #Timesup, and the men who are standing with them. She helped us to dream about a beauty beyond herself, her work, her role, her company, her vision. I have been to too many conferences to hear white men speak about their work, their three easy steps of making a great multiethnic church, the country they saved from starvation, the new insights on a theology of justice, their take on cruciform “whatever” where I am supposed to leave applauding their insight. And the sad thing is that the ego is so sneaky they don’t even know it’s happening. There are a few friends I have that are constantly centering others so that when you leave, your thoughts are not actually on the leader but on the people, vision, mission about which they shared. When you write and speak and influence, are you more infatuated with what was tweeted about you, or are you thanking God that those who are typically left in the margins, have been seen? Presence, space, words is such an incarnation matter-of-fact. Well said, siStar! Thank your your patience as we work to understand. Thanks for not giving up on us.